Disposable wedding plates and elegant plastic tableware make your special day perfect and hassle free. Check out our numerous styles and colors. You can have opulent cutlery without the worry of clean-up. 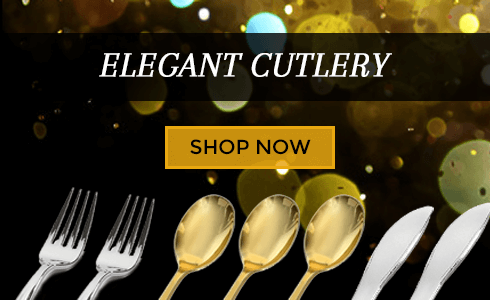 Our elegant cutlery and silver-like plastic flatware looks amazing and eliminates the cleanup. Disposable wedding glasses give you attractive toasts without worrying about broken glass. Disposable plastic wine glasses are safe and inexpensive. 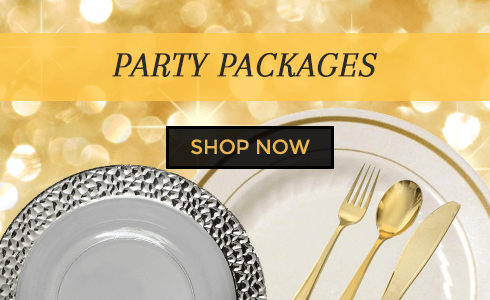 Don't spend hours looking for the perfect elegant plastic plates or gold disposable cutlery when you can get everything you need from our party packages. 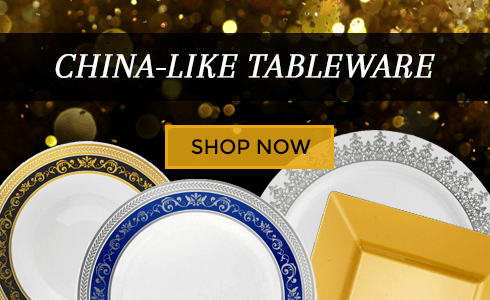 Whether it's a wedding reception or elegant dinner party, don't worry about breaking the fine china or spending your entire budget on tableware. Elegant, but disposable, dinnerware gives you the look of more expensive options without the price tag. We have a large selection of plastic wedding plates and silver-like plastic cutlery that looks amazing and you can simply throw away when done. Don't let your New Year's party, wedding shower or anniversary party be marred by cheap looking plates and inappropriate tableware. Our plastic tableware has the look of real china to give your party, and its special guests, the respect they deserve. You can pick from products individually or choose one of our party packages. 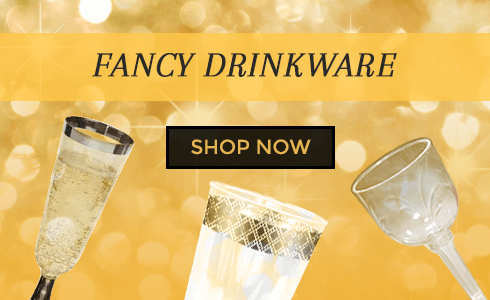 A Party Source has everything you need for plastic elegant tableware in one place. A party or reception takes hours and hours of planning and when it finally happens, the last thing you want to do at the end of the night is clean up the mess and wash innumerable dishes. With disposable wine glasses and plastic luxurious dinnerware, once the party is over, everything goes in the trash. It's the elegant and practical alternative to using expensive and hard to clean dishes.